You can pay by direct bank transfer, through PayPal or major credit cards. All Credit card and PayPal money transactions are secured via PayPal. We deliver to your doorstep by DPD. Shipping charge is 15,50 € , tax excl. / delivery. Order will be delivered within 2-3 days after receiving payment. DPD delivery times 2-7 days depending country. You will receive a tracking number for your info. 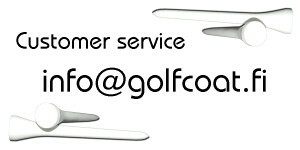 If you want to return goods you MUST inform us in an e-mail to our Customer Service. If you wish to return faulty goods please e-mail to Customer Service, include full details of the problem and your order number. You will receive further instructions by e-mail. All attempts to place false orders or attempts to deceive will be reported to the local police authority. Any dispute concerning these conditions is to be settled in accordance with Finnish law, since Golf Coat Ltd. is situated in Finland and since Finland is the country where all business transactions take place. We do not collect any personal information except where it is specifically and knowingly provided by you with your consent. We only collect personal information that is necessary to process and fulfill your orders or undertake the facilities offered by this site. We only keep personal information for as long as is required and for the purpose it was collected. As an additional security measure we remove all payment details from our servers as soon as practicable after the order is processed. The customer is responsible of all supplied materials (logos, texts, etc.) for printing.